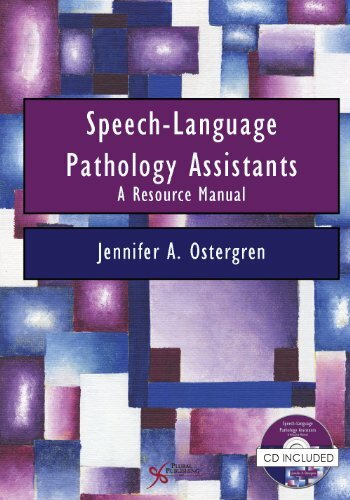 Written specifically with speech-language pathology assistants (SLPAs) in mind, Speech-Language Pathology Assistants: A Resource Manual, is a practical, easy-to-use manual that can be used by both SLPAs and SLPA educators. The text defines the roles of SLPAs and their supervisors offering additional insight into the scope of practice of an SLPA per current American Speech-Language and Hearing Association (ASHA) recommendations and includes discussions, strategies, and examples of real-world issues, such as using augmentative and alternative communication (AAC) and working with individuals with autism spectrum disorders (ASD). Also included within the chapters are Things to Consider sections, which address important factors and modifications that can enhance the effectiveness of treatment activities. For example, incorporating play, literacy, and speech sound remediation into treatment or modifying the clinical interface to enhance group therapy dynamics for children and adults. Within the text are chapters devoted to specific aspects of an SLPAs development. Chapters on clinical service enhance SLPAs understanding of goals, lesson plans, data collection, and note-writing. Likewise, chapters on professional practice offer insight into ethical problem-solving, presenting a professional image, developing mentoring relationships, working with culturally and linguistically diverse populations, and the use of self-reflection for self-improvement. Another notable feature of this text is the appendices, which include checklists, exercises, forms, and clinical tools and resources for SLPAs. As a key resource for enhancing skills and highlighting professional practice issues, for clinical practicum training or future employment, this is a text both SLPAs and SLPA educators will want to have on their bookshelves.